On VR Coaster At Six Flags, The Ride Is Just Half The Thrill : All Tech Considered Magic Mountain in Southern California has a roller coaster in which riders put on VR goggles to see an imagined world while their bodies undergo the physical thrills. How is it? We get a review. 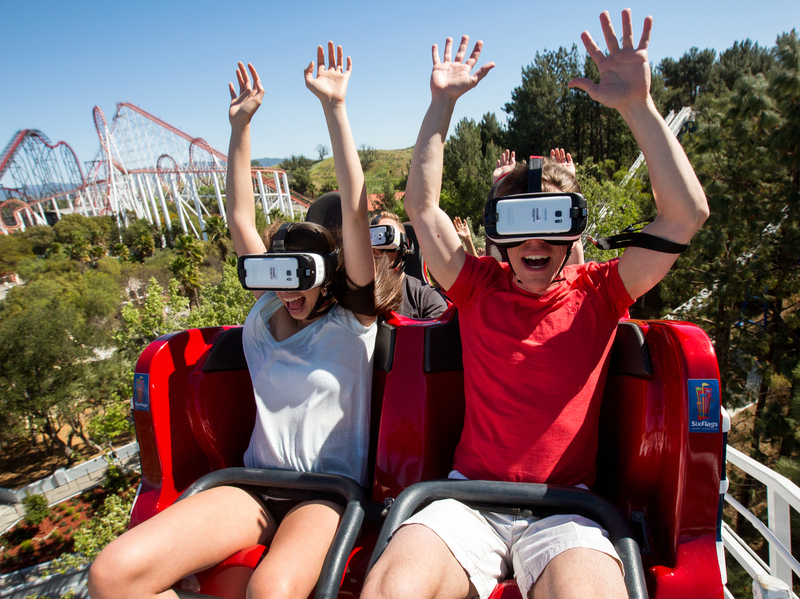 At Six Flags Magic Mountain in Valencia, Calif., riders of the New Revolution Virtual Reality Coaster wear VR goggles to play a video game while the roller coaster twists and turns. My interest in this ride is a little different from Magic Mountain's core demo of teen and 20-something thrill-seekers. I'm a professor at Syracuse University and have a fascination with virtual reality. I've experimented with nearly everything. But a VR roller coaster, well, that's something new. "Any anxieties?" I ask them. "I'm more excited than scared," George says. "I don't know, it all depends on the ride, how intense it is." "Chin up, please," Gillett says. "And what do you see?" "I see turrets — I see gun turrets," I answer. "So remember, on your right-hand side of your goggles, use your pointing finger to shoot the gun," Gillett says. I can see out of the cockpit of an aircraft I'm about to fly. As the countdown to liftoff begins, I'm struck with terror: I heard and felt the lap-bar lock into place, but I can't see whether I've fastened my seat belt. "Is my seat belt buckled?" I stammer. "Yeah, your seat belt's all buckled and everything," Gillett tells me. "You're all good." What riders see through their virtual reality goggles while riding on Six Flags Magic Mountain's new VR roller coaster. The scenes in the goggles exaggerate our real-world twists, turns and loops. In the VR goggles, our first major drop looks like we're falling almost straight down, though it's more gradual in real life. The ride is more of a first-person shooter video game than a story with a narrative arc. But parts of it remind me of Blade Runner and Inception, as I see buildings collapsing around me. It's disorienting and exhilarating. The 2 1/2 minutes seem short as the ride ends — even though I feel mild nausea setting in. 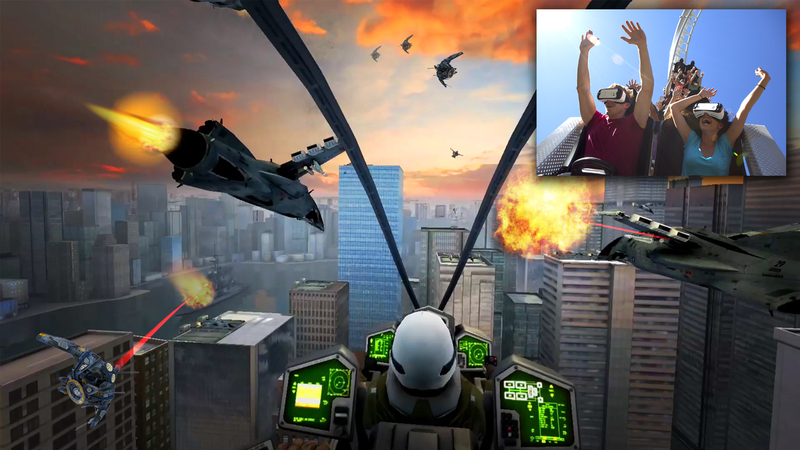 In the VR world, we land on what looks like an aircraft carrier. The ride's biggest shortcoming, however, was sound. Audio could have been as immersive as the visuals, though perhaps the designers figured that hearing other riders was enough. "Deep breaths. I'm almost recovered," I say when the ride ends. "How about you all?" "Yeah," say George and Fregoso, along with fellow rider Kayla Soto. I ask George and Soto why they'd want virtual reality on top of an already crazy experience — and how this compared to VR at other theme parks. "Those rides you just sit down and you watch a screen," George says. "This one, you're actually on a ride, in a world, and you're interacting with this. So I think that's really like huge and awesome." "It felt like we were in a video game, so that was fun," Soto adds. "It gave you another thrill that a roller coaster can't give." With VR, theme parks can change rides with software, instead of years of construction. My shirt's soaked with sweat, my mind and body's unnerved, and it'll be at least a half hour before I feel comfortable driving the freeway. But it's something everyone should try — at least once.